I’d rather meet Dirty Diana before the Diana in Lights Out. Quite some time ago, Rebecca (Teresa Palmer) left her mother, Sophie (Maria Bello) and younger brother, Martin (Gabriel Bateman) not on the best of terms. She left mainly due to her mother, who has long suffered from a litany of mental issues. Rebecca receives word from the Child Protective Services agency that Martin is having trouble staying awake in class, and she suspects her mother could be off of her medication and terrorizing Martin. That may be the case, but Martin claims it is some entity that only comes out in the dark—Diana—an old “friend” of Sophie’s. A surprise subplot of an otherwise underwhelming summer season is that small horrors/thrillers have not only been bankable (a usual given) but generally entertaining. Okay, The Purge: Election Year is divisive depending on who you talk to, but The Shallows, The Conjuring 2, and now Lights Out have made for a pretty good smattering of low budget horror. Any good horror movie is a win for the horror movie genre in this day and age. 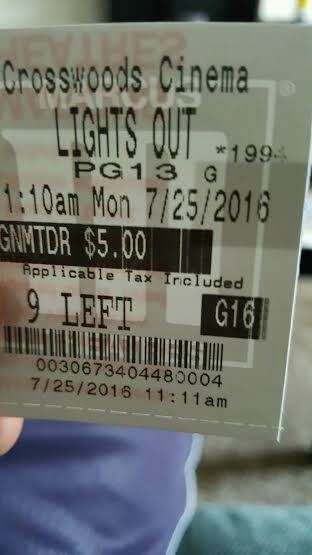 Lights Out is a good, solid, competent horror movie. What Lights Out has going for it is a man overseeing the production with a stellar track record as it pertains to frights. Even if he isn’t directing, having James Wan, probably the best horror director today, on as a producer can only mean a good thing. Directed by David F. Sandberg, Lights Out, especially in its second half and climax, makes use of its, ahem, lights out premise to stage a few striking scenes. The beginning may actually take the cake, but a scene with black light is certainly a highlight as well. Jump scares are in good supply here, but most are actually legit, not many false ones for the sake of having them. Not even 90 minutes, Lights Out, expounded on from an original short directed by Sandberg, is trim with its story. It gets going immediately with the beginning and doesn’t overstay its welcome. Story information is parsed out evenly, with the only misstep being some heavy exposition that explains the connection the antagonist has to the main characters in the film. As far as the actual antagonist goes, she’s pretty universal in the sense that she can be anywhere in an absence of light. But sort of like It Follows, not much rhyme or reason is given to what her limitations are. Granted, the darkness aspect is a better mechanic and more straightforward than the “pass it on” one; still, a little definition would have been appreciated, for the tastes of yours truly at least. Logic is often lost on characters that appear in horror movies. Not so with those in Lights Out. Teresa Palmer is the de facto lead, and she does a serviceable job while being a good heroine. But she is outshined in this movie by a few performers. Maria Bello, in particular, does great work with a role that could be cringy with other thespians, but with her she makes it believable and even heartbreaking. Most kids are of the annoying variety in horrors or simply cannot act in them, but again, not so with Gabriel Bateman as the young Martin. He sells fear well. Even Palmer’s boyfriend Bret (Alexander DiPersia) is notable as a lovestruck boyfriend who will do anything for Rebecca. Arguably, he has the best moment in the entire movie when evading the baddie, deliciously humorous and heady. All together though, there is a real family element that outlines the feature, and the main cast actually feels like a family, also not something always achieved in scary movies. Lights Out won’t leave one leaving every outlet installed with a night light, but it is effective more than not as a short, lean, and family-oriented horror film. Much worse is out there. Photo credits go to clickthecity.com, and warnerbros.co.uk. Saw it on Tuesday and thought it was excellent. I agree with your review and the short (compared to today’s 3 hr films) running time was just perfect enough for it not to wear out its welcome. I complain sometimes about runtime, both it being short and too long. For this horror movie, though, this felt just right. No filler or extreme leanness. I really liked this one. Well made and well acted. I particularly loved how it captured the human element. This were characters I actually cared about. Me too Keith. I thought some of the scares were effective as well, but I’m a middleweight when it comes to horror lol. Nice review! I haven’t yet seen this, though. The short scared the s**t out of me. Wondering if the feature will pack the same punch for me. Thanks for reading! I’ve heard that the short is freaky, and this, though it has some scares (I like to think I’m a middleweight when it comes to horror), probably doesn’t compare.